Gruppo Gamma makes some really cool watches. I have reviewed several of them and all were quite nice. Back in March of 2017 I reviewed their Vanguard A-04D (which you can see here.) That model has a rotating bezel and was powered by a Seiko NH35A movement. Gruppo Gamma has since discontinued that model and replaced them with the new Vanguard models. I got the chance to review the upgraded Bronze Vanguard Retro AN-13 and it’s all so, so good. I am really liking the dial on this Retro Vanguard. The green, surrounded by the bronze case? It really gives it that retro vibe. This is a simple three hander with lumed hour and minute hands, over a sandwich dial that gives some dimensionality to things. There is no rotating bezel on the Retro Vanguards (but you can get one on the other Vanguards). The bezel on this one is tapered and flush with the crystal. Overall I feel the look of this dial is just right. Clean and simple. 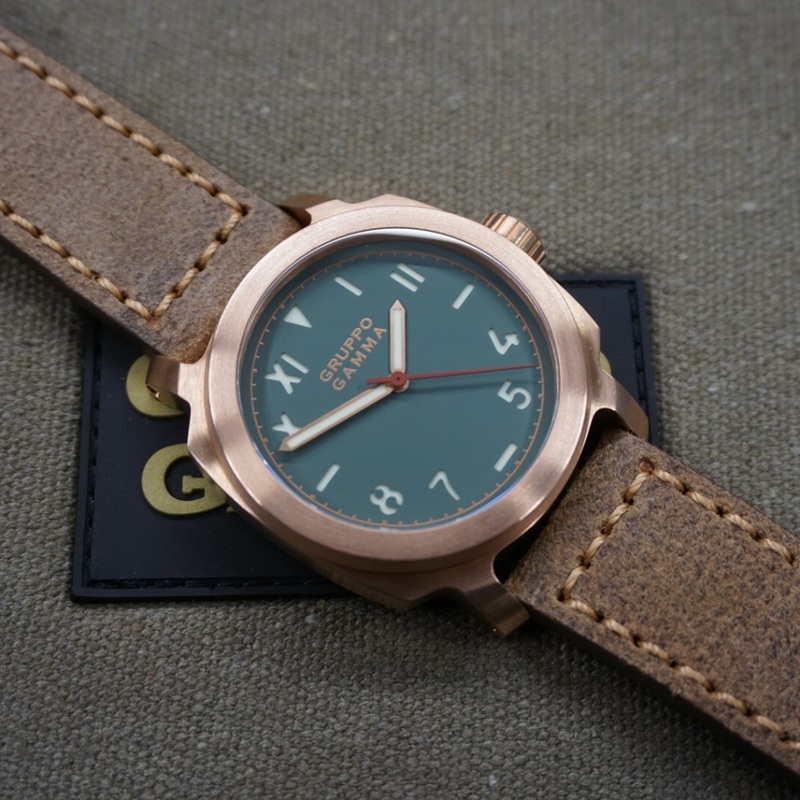 Made from bronze and measuring in at 44mm, this case really has the vintage diver tool watch look. Case is screw down and has the cool scull and rose Gruppo Gamma logo. The total weight of this is 140g – on the strap – which is just right. The screw-down crown is also made of bronze and really fits the proportions of the case. It’s also worth noting that the build quality and finish are very well done. A heavy duty strap befits a heavy duty watch and the one that came with this model couldn’t match any better. This strap is thick with contrast stitching, but not stiff, which means it’s quite comfortable all day long. The pin and buckle clasp is also made from bronze and large but fits the look of the watch. This Gruppo Gamma Retro Vanguard looks very nice in the dark. Using Swiss Super-LumiNova C3 on the hands and hour makers the watch glows and glows. As I am sure you have noticed I really like the watches from Gruppo Gamma. The put a lot of attention into the build quality of their watches. One is the biggest changes they have made to their new line of Vanguards is that they have upgraded the movement from the Seiko NH35A movement to the Swiss made ETA 2824-2. Adding to the great build quality of the watch this new movement choice really kick things up. For a price of $850 usd this is not a bad deal for what you get. If you like what you see go check them out at gruppogammawatches.com. What I’d change: Like it the way it is. The best thing about it: Its tough retro look. Distressed leather strap, burnt brown color, length 125/75mm, width 24/22mm with buckle. Leather has been treated to achieve a distressed look – scars, uneven texture etc. are deliberate, and no two straps are alike.